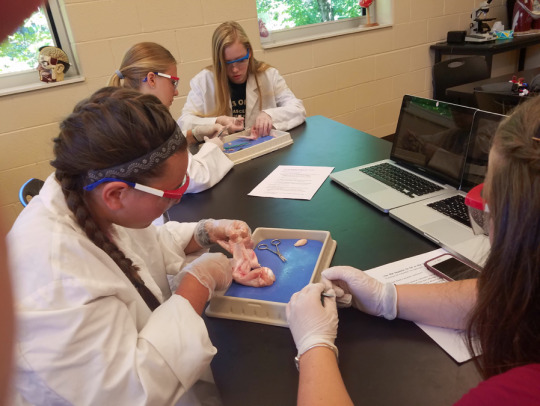 Clarksville Academy students in the dual enrollment Anatomy and Physiology course receive credit for Biology 2010 and 2011. This is a sophomore level course that serves as a prerequisite for the nursing and pre-professional programs at Austin Peay State University (APSU). Clarksville Academy students have proven to be academically competitive with main campus sophomores. From the 2010 enrolled class to the conclusion of this past fall semester of 2016, our students have had a 100% pass rate. The overall class average for the lecture portion of the course was a B, while the lab portion was an A. Additionally, our students’ class average for the lab mid-term and final exams were higher than the main campus class averages by 10 points. course complete the lecture portion of the class at the Clarksville Academy campus, and travel to the Sundquist building at APSU for the lab portion. The labs that students participate in are exceptional. Not only are students dissecting and identifying structures using models, our students use biopic equipment to monitor their MMUR, ECGs, and lung volume. They also conduct blood typing, urinalysis, and create a hematocrit. Clarksville Academy is dedicated to not only preparing each student for college, but to giving them the tools to excel. For more information on our Upper School honors, AP and Dual Enrollment classes visit us at: https://clarksvilleacademy.com/academics/upper-school/.